The U.S. Department of Education is currently accepting public comments (through August 30) on their proposed borrower defense to repayment regulations, which affect students’ ability to get loans forgiven in the case of closed schools or colleges that misrepresented important facts. Since these regulations also affect colleges and taxpayers, I weighed in to provide a researcher’s perspective. My comments are reprinted below. My name is Robert Kelchen and I am an assistant professor of higher education at Seton Hall University. As a researcher who studies financial aid, accountability policies, and higher education finance, I have been closely following the Department of Education (ED)’s 2017-18 negotiated rulemaking efforts regarding borrower defense to repayment and financial responsibility scores. Since there were no academic researchers included in the negotiated rulemaking committee (something that should be reconsidered in the future! ), I write to offer my comments on certain segments of the proposed regulations. My first comment is on the question of whether ED should accept so-called affirmative claims from borrowers who are not yet in default and seek to make a claim against a college instead of only accepting defensive claims from borrowers who have already defaulted. For colleges that are still open, this is a clear decision in my view: affirmative claims should be allowed because ED can then attempt to recoup the money from the college instead of effectively requiring the taxpayer to subsidize at least some amount of loan forgiveness. However, the decision is somewhat more complicated in the case of a closed school, where taxpayers are more likely to foot the bill. My sense is that affirmative claims should probably still be allowed given the relationship between defaulting on student loans and adverse outcomes such as reduced credit scores. To protect taxpayers and students alike, more needs to be done to strengthen federal requirements for colleges that are at risk of closure. If a college closes suddenly, students may be eligible to receive closed school discharges at taxpayer expense. Yet my research and analyses show that ED’s current rules for determining a college’s financial health (the financial responsibility score) are only weakly related with what they seek to measure. For example, several private nonprofit colleges that closed in 2016 had passing financial responsibility scores in 2014-15, while many colleges have continued to operate with failing scores for years. I also found that colleges did not change their revenue or expenditure patterns in any meaningful way after receiving a failing financial responsibility score, suggesting that colleges are not taking the current measure seriously. I am heartened to see that ED is continuing to work on updating the financial responsibility score metric to better reflect a college’s real-time risk of closing through another negotiated rulemaking session. However, I am concerned that students and taxpayers could suffer from continuing with the status quo during a potential six-year phase-in period, so anything to shorten the period would be beneficial. I again urge ED to include at least one academic researcher on the negotiated rulemaking panel to complement institutional officials and accountants, as the research community studies how colleges respond to potential policy changes that the rest of the committee may be proposed. Finally, I am concerned about ED’s vague promise to encourage colleges to offer teach-out plans instead of suddenly closing, as the regulations provide no incentives for colleges on the brink of financial collapse to work with accreditors and states to develop a teach-out plan. 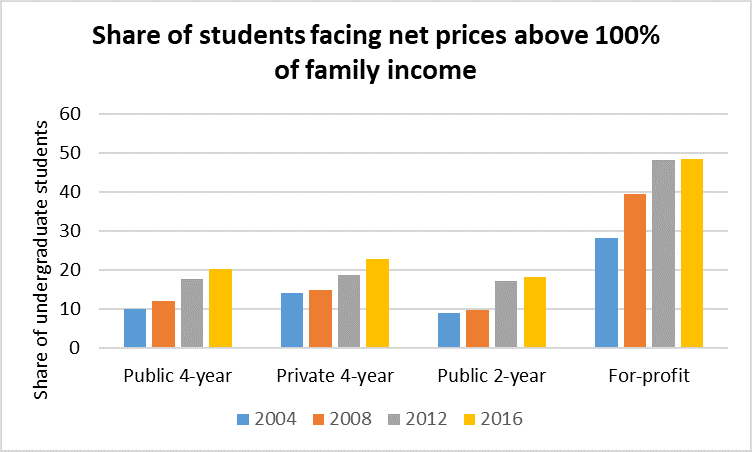 It would be far better for ED to require colleges to be proactive and develop teach-out plans at the first sign of financial difficulties, reducing the risk to taxpayers by minimizing the risk of closed school discharges. These plans can then be approved by an accreditor and/or state agency as a part of the regular review process. Colleges would likely contend that having to develop a pre-emptive teach-out plan may affect their ability to recruit and retain students, but tying this to an existing benchmark of federal concern (such as a low financial responsibility score or being on HCM2) should alleviate that issue. Thank you for the opportunity to provide comments on these proposed regulations and I am happy to respond to any questions that ED staffers may have. All opinions reflected in this commentary are solely my own and do not represent the views of my employer. Blagg, K. (2018). Underwater on student debt: Understanding consumer credit and student loan default. Washington, DC: Urban Institute. Kelchen, R. (2017, March 8). 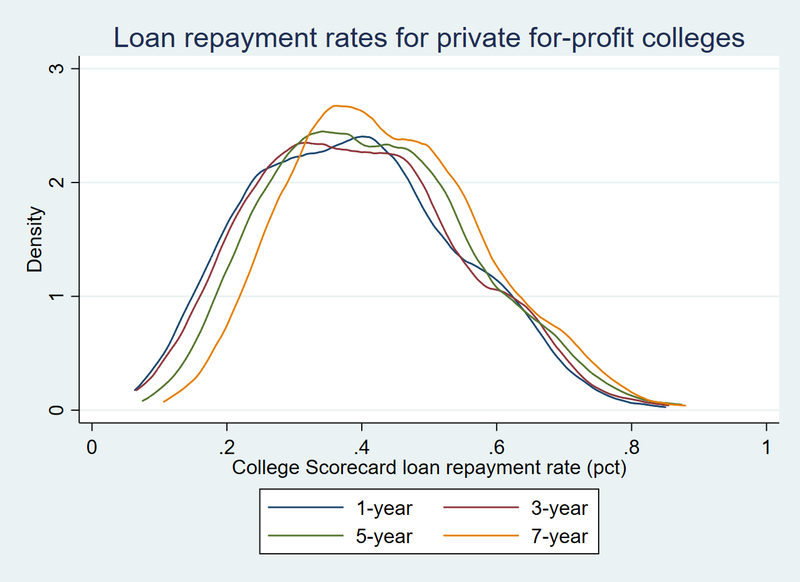 Do financial responsibility scores predict college closures? https://robertkelchen.com/2017/03/08/do-financial-responsibility-scores-predict-college-closures/. Kelchen, R. (forthcoming). Do financial responsibility scores affect institutional behaviors? Journal of Education Finance. The U.S. Department of Education’s Office of Federal Student Aid has slowly been releasing interesting new data on federal student loans over the last few years. In previous posts, I have highlighted data on the types of borrowers who use income-driven repayment plans and average federal student loan balances by state. But one section of Federal Student Aid’s website that gets less attention than the student loan portfolio page (where I pulled data from for the previous posts) is the Title IV program volume reports page. For years, this page—which is updated quarterly with current data—has been a useful source of how many students at each college receive federal grants and loans. While pulling the latest data on Pell Grant and student loan volumes by college last week, I noticed three new spreadsheets on the page that contained interesting statistics from the 2015-16 academic year. One spreadsheet shows grant and loan disbursements by age group, while a second spreadsheet shows the same information by state. 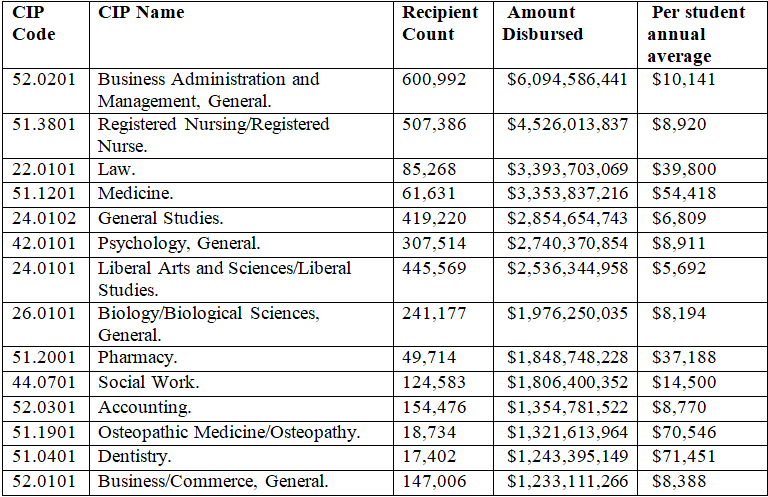 But in this blog post, I look at a third spreadsheet of student loan disbursements by students’ fields of study. The original spreadsheet contained data on the number of recipients and the amount of loans disbursed, and I added a third column of per-student annual average loans by dividing the two columns. This revised spreadsheet can be downloaded here. Of the 1,310 distinct fields of study included in the spreadsheet, 14 of them included more than $1 billion of student loans in 2015-16 and made up over $36 billion of the $94 billion in disbursed loans. Business majors made up 600,000 of the 9.1 million borrowers, taking out $6.1 billion in loans, with nursing majors having the second most borrowers and loans. The majors with the third and fourth largest loan disbursements were law and medicine, fields that tend to be almost exclusively graduate students and can thus borrow up to the full cost of attendance without the need for Parent PLUS loans. As a result, both of these fields took out more loans than general studies majors in spite of being far fewer in numbers. On the other end (not shown here), the ten students majoring in hematology technology/technician drew out a combined $28,477 in loans, just ahead of the 14 students in explosive ordinance/bomb disposal programs who hopefully are not blowing up over incurring a total of $61,069 in debt. Turning next to programs where per-student annual borrowing is the highest, the top ten list is completely dominated by health sciences programs (the first two-digit CIP not from health sciences is international business, trade, and tax law at #16). It is pretty remarkable that dentists take on $71,451 of student loans each year while advanced general dentists (all 51 of them!) borrow even more than that. Given that dental school is four years long and that interest accumulates during school, an average debt burden of private dental school graduates of $341,190 seems quite reasonable. Toss in income-driven repayment during additional training and it makes sense that at least one of the 101 people with $1 million in federal student loan debt is an orthodontist. On the low end of average debt, the 164 bartending majors ran up an average tab of $2,963 in student loans in 2015-16 while the 144 personal awareness and self-improvement majors are well into their 12-step plan to repay their average of $4,361 in loans. 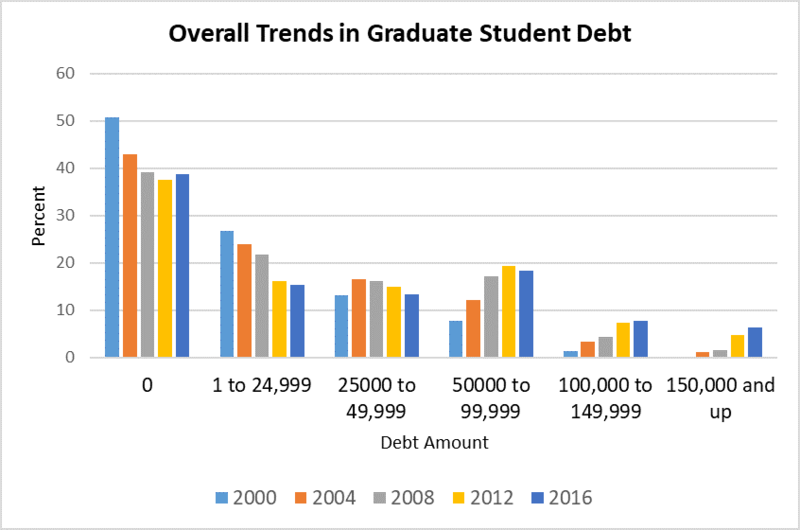 Author RobertPosted on May 17, 2018 Tags data, debt, student loans3 Comments on What Explains Racial Gaps in Large Graduate Student Debt Burdens? 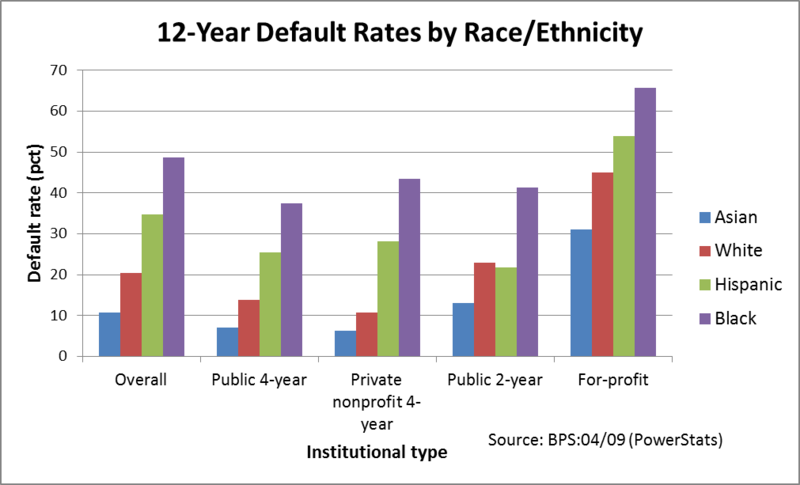 Since the release of long-term student loan default data in the Beginning Postsecondary Students Longitudinal Study last fall, one finding that has gotten a great deal of attention is the large gap in default rates by race and ethnicity. 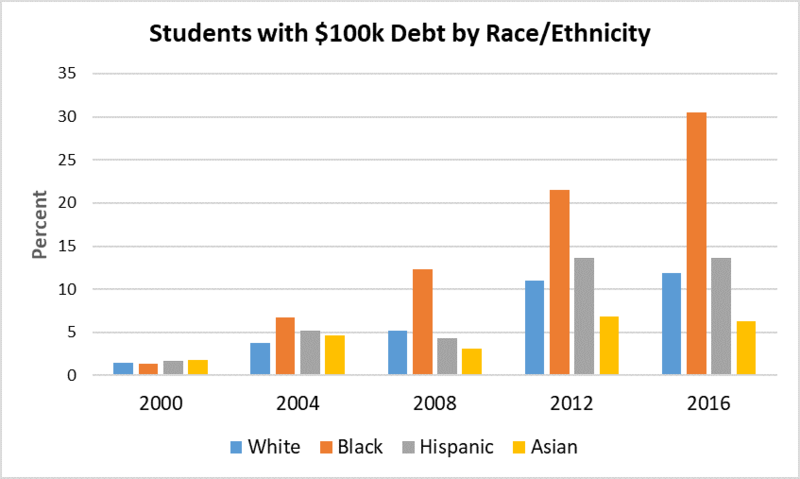 Judith Scott-Clayton of Teachers College, Ben Miller of the Center for American Progress, and I all highlighted the high percentage of African-American students who began college in the 2003-04 academic year and defaulted on their loans by 2015. As the chart below shows, black students were more than twice as likely to default on their loans than white students (49% versus 20%), with some differences by institutional type. In the first regression, the odds ratios for black (3.69), Hispanic (2.09), multiracial (2.56), and American Indian/Alaska Native students (2.45) were all significantly higher than white students at p<.05, while Asian students (0.48) had significantly lower default rates. 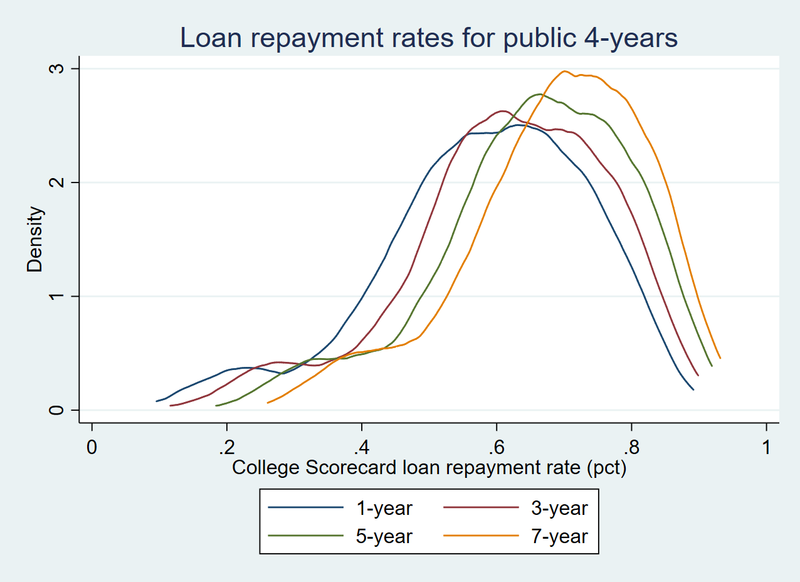 Results of logistic regression predicting student loan default rates by 2015 (with controls). Source: Beginning Postsecondary Students Longitudinal Study. After adding in control variables, the coefficients for underrepresented minority students were somewhat smaller. But for African-American (2.56) and multiracial (2.45) students, they were still significantly higher than for white students after adding other controls. This means that black students were about 150% more likely to default than white students—an enormous gap after taking a number of other important factors into account. 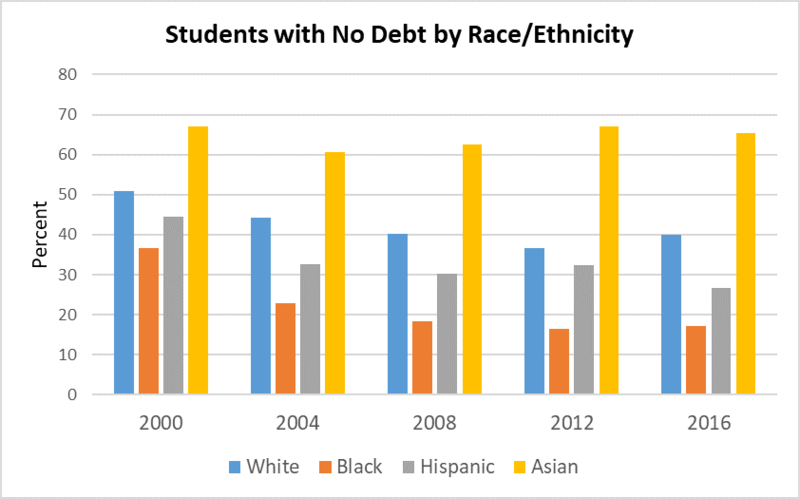 The coefficients for Hispanic and American Indian students were no longer significant, and Asian students were still less likely to default than white students (an odds ratio of 0.42). 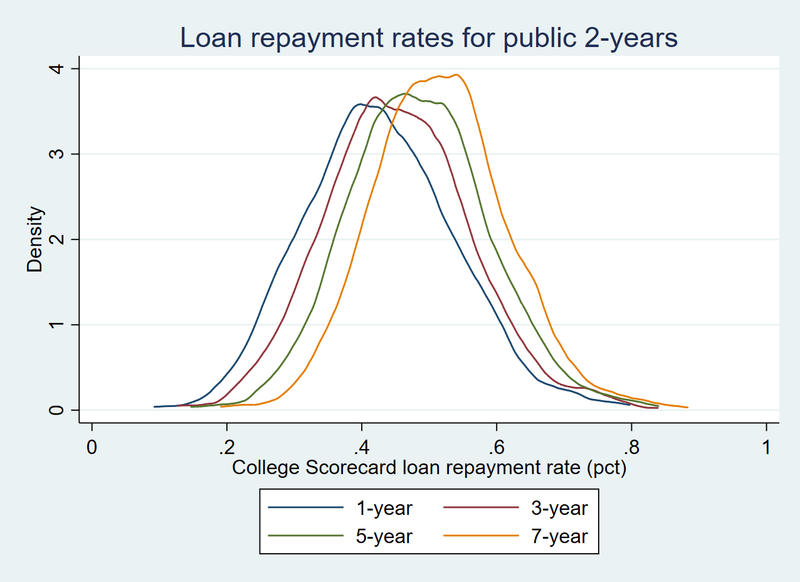 Additionally, the regression also shows the importance of parental education, family income, and sector of attendance in predicting the likelihood of long-term default. 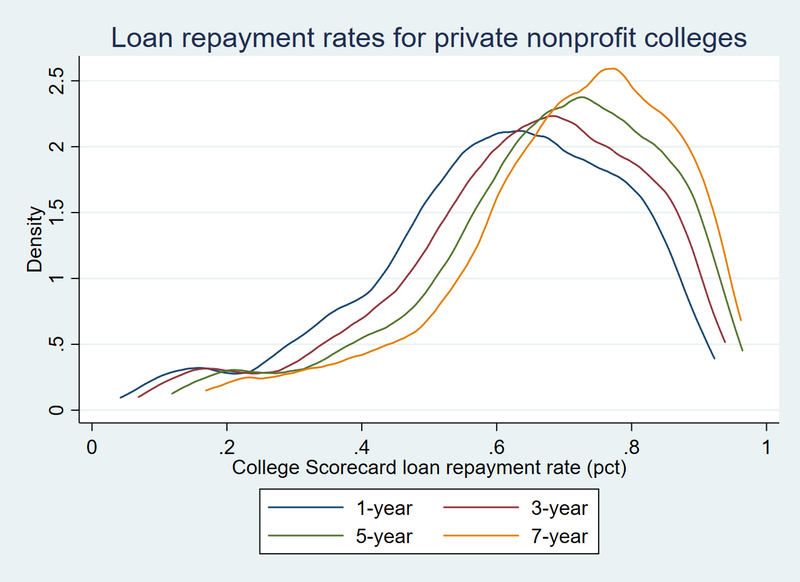 Notably, students who began at a for-profit college were about 120% more likely to default on their loans than community college students, while four-year students were less likely. Men were 36% more likely to default on their loans than women, an interesting finding given men typically earn more money than women. 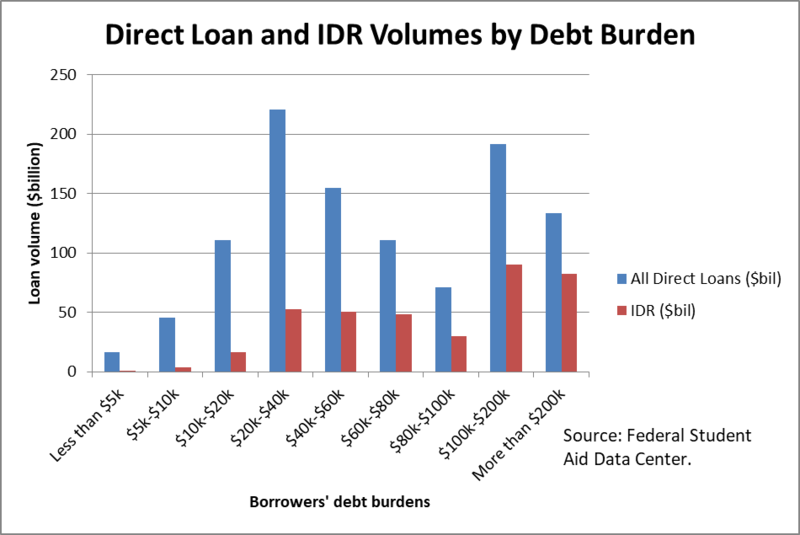 Much more needs to be done to dig deeper into factors associated with long-term student loan default rates. But at this point, it appears clear that other demographic and institutional characteristics available in the BPS do relatively little to explain the large gaps in default rates between black and white students. 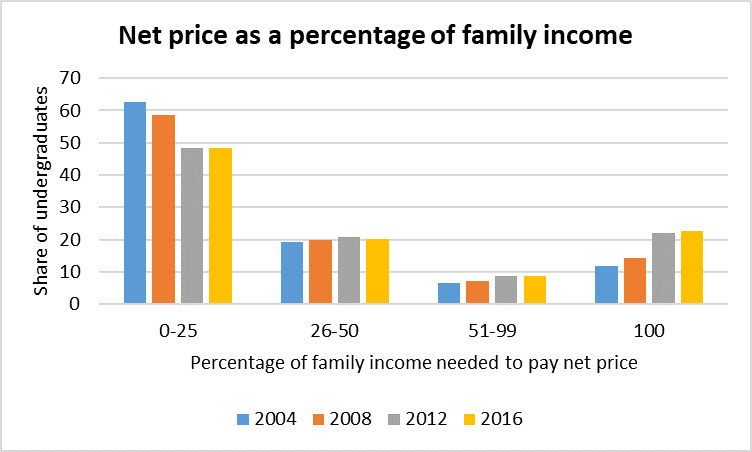 It would be helpful to have measures of family wealth available given large black-white differences in wealth to see how much of the variation in default rates is due to family resources. Author RobertPosted on January 16, 2018 February 1, 2018 Tags accountability, data, debt, student loans6 Comments on Who Uses Income-Driven Repayment Plans?